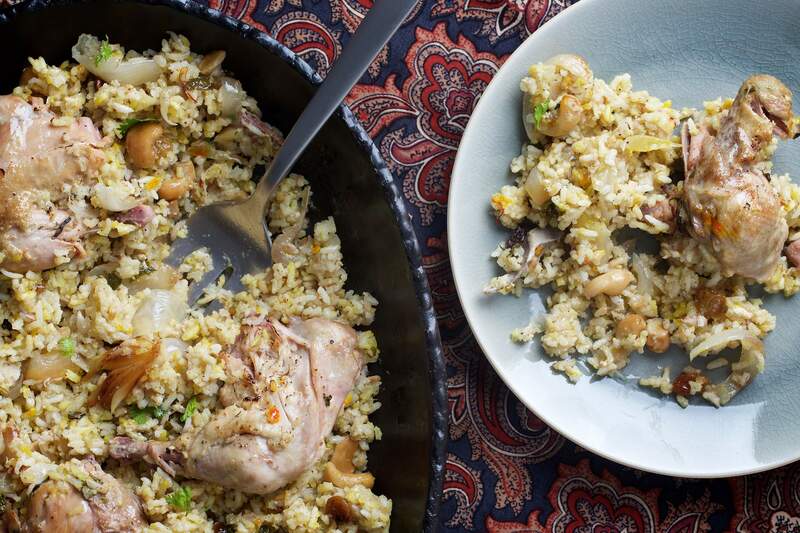 Malabar Chicken Biryani is just one of the 300 recipies collected in Anissa Helou’s new book, “Feast: Food of the Islamic World.” The cookbook showcases a range of dishes from throughout the Muslim world. Helou’s book contains more than 300 recipes, from simple suppers to festival fare. “Feast” is also a testament to how recipes can morph from country to country, or even between cities, as spices are added and techniques change. Unable to pick just one, Helou offers recipes for seven biryanis, from the slow-cooked, one-pot dish of Hyderabad to a Kolkata variation with potatoes. Even the United Arab Emirates has a version, albeit with fewer spices and no meat. 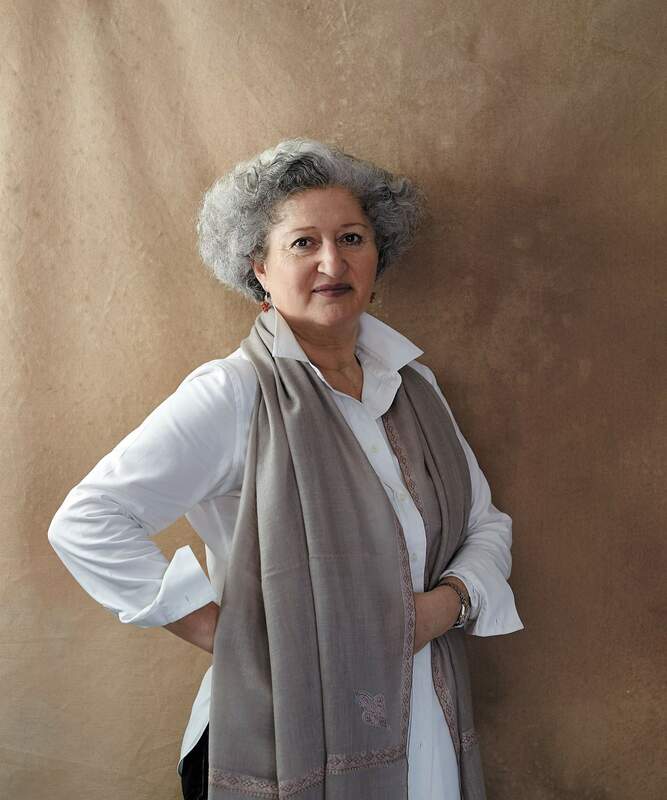 “You could see the commonalities, but each time it’s different, wonderful,” Helou said. But it is the food of the Levant – particularly Lebanon and Syria – for which the book reserves the greatest affection, with references to the grilled Syrian kibbe that Helou ate during childhood visits to her aunt’s house in the town of Majd al-Helou, and a sumac version she ate with friends in Aleppo’s Old City. “There is something about the cuisine of these places there that is almost mythical because of how many cultures have passed through them,” she said. Her favorite meal, even after years of traveling the world, is still Aleppo’s glistening sour cherry kebab. This is celebration food in the northern part of India’s Kerala region, so special that it is served the night of a Muslim (Moplahs) wedding ceremony. 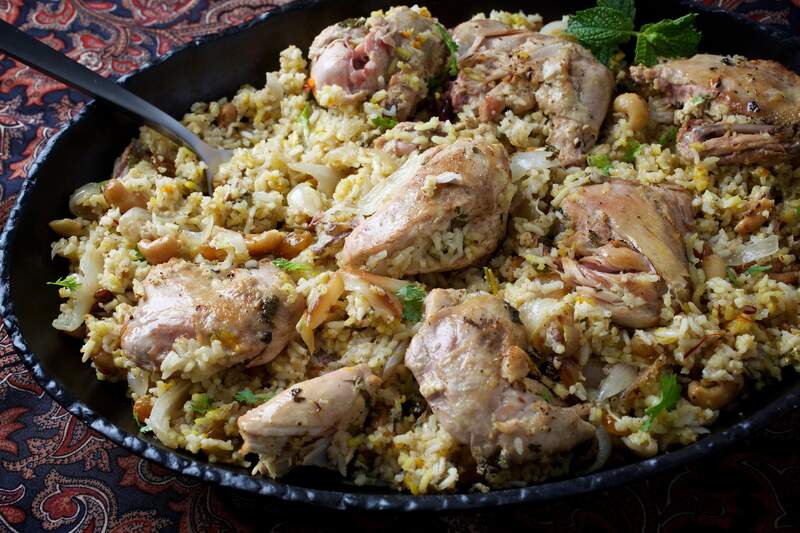 As biryanis go, it is relatively mellow, and different because the rice is cooked separately before it is added to the chicken.The ingredient list is on the long side, but the prep and cooking go fairly fast. The garam masala blend suggested for this recipe includes mace, cinnamon and green cardamom; if you’re game to make it from scratch, see the NOTE, below. Ingredients:1/3 cup golden raisinsGenerous pinch of saffron threads2 tablespoons rose water1/2 cup ghee or vegetable oil4 small onions (about 14 ounces total), halved and cut into thin wedges3 or 4 mild green chile peppers, seeded and minced (2 ounces total)One 2-inch piece peeled fresh ginger root, minced6 cloves garlic, minced to a paste1/2 teaspoon poppy seeds, finely crushed2 Cornish hens, cut into quarters (about 3 1/4 pounds total; may substitute 1 whole chicken of that weight, cut into 8 pieces)Sea salt2/3 cup plain full-fat yogurt3 cups waterJuice of 1 lime, or more as needed1/3 cup unsalted cashews, coarsely chopped2 1/2 cups long-grain rice1 teaspoon garam masala (see headnote and NOTE)A few sprigs cilantro, coarsely chopped (leaves and tender stems; may substitute mint), for garnishMethod:Place the raisins in a small bowl; cover with water and soak for an hour or two, then drain. Add the yogurt and ¼ cup of the water, stirring to incorporate. Reduce the heat to low; cover and cook for 15 minutes, then add the lime juice and another ¼ cup of water; cover and cook for 15 minutes or until the chicken is cooked through and the liquids have thickened into a sauce. Turn off the heat. Rinse the rice under cool water and drain well, then add to the same pan you used for the cashew mixture. Stir to coat with the fat in the pan; cook for few minutes, then add the remaining 2½ cups of water. Increase the heat to medium-high; once the liquid boils, reduce the heat to medium-low and cook for 10 to 15 minutes, or until the rice is tender and has absorbed the water. Remove from the heat. Warm up the pot with chicken and sauce, over low heat. Sprinkle ¼ teaspoon of the garam masala over the chicken, then fluff the rice in the pan with a fork and spread a third of it over the chicken and sauce. Drizzle 2 teaspoons of the saffron-infused rose water evenly over the layer of rice. Spread half the cashew mixture over the top. Sprinkle another ¼ teaspoon of garam masala over the surface of the mixture, then cover with another third of the cooked rice. Sprinkle with another 2 teaspoons of saffron water and add another layer of the cashew mixture. NOTE: To make Anissa Helou’s garam masala for this dish, combine ¼ cup anise seed, ¼ cup caraway seed, ¼ cup cumin seed, 2 tablespoons green cardamom pods, 2 tablespoons whole cloves, two 3-inch easy-to-shred cinnamon sticks, 2 whole nutmegs and a few shards of mace in a skillet over medium heat. Cook for a minute or two, until fragrant. Let cool, then transfer to a dedicated spice grinder and pulse until finely ground. The yield is about 1¼ cups; store in a glass jar for up to 1 year. 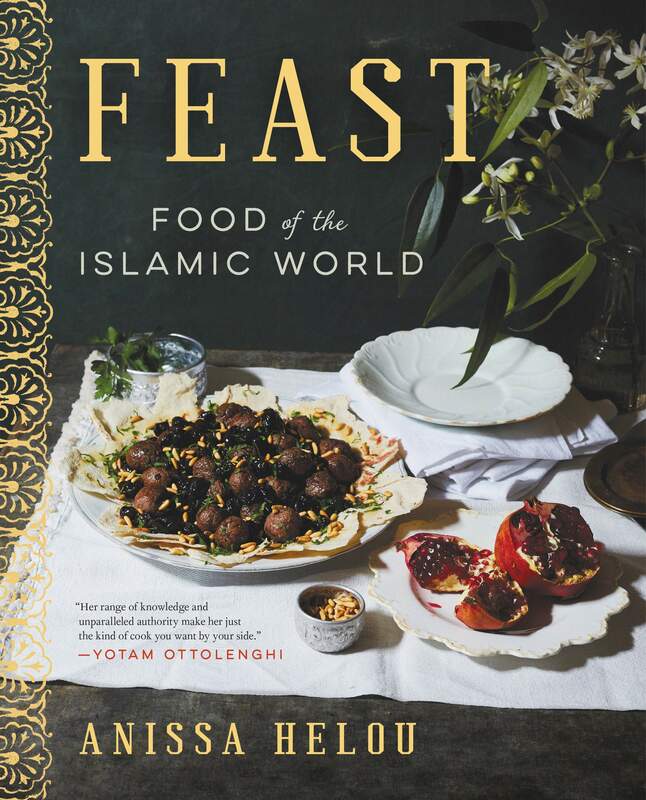 Source: Adapted from “Feast: Food of the Islamic World,” by Anissa Helou (HarperCollins, 2018).